We started our new chore charts after we moved into our new house. So, how are we doing so far? The kids have done really well with helping me keep up with the house. I created the chore charts and we spent time training them on their chore zones for about 2 weeks. Bee is in charge of dusting, Tiger does the vacuuming and some mopping, and Curly cleans bathrooms. My hubby is a huge help with laundry and the kitchen cleaning is largely my responsibility. Training – You can’t expect the chores to be done well if you haven’t taken ample time in training your kids how to do them. I spent time doing the chores alongside my kids to show them exactly what they needed to do each day. It’s about teaching and training. I want my kids to do their chores well enough that I don’t have to come behind them and redo those chores. I want the chores done correctly and I can’t expect that of them if I haven’t taken tons of time in modeling what I want done. This is the time consuming part! Simplicity – We’ve tried several chore charts and other systems. I do great for the first couple weeks. We stick to our system and we have our stickers or chore cards and we keep up. Then we start to fall behind. I get tired of all the stickers or cards or rewards and the kids are less motivated to keep up with their own charts. Then we let everything go and forget all about the chores because it just took too much time to keep up with our system. I’ve finally learned that simple is best. Our chore chart is simply a short list for each child – it lists the day of the week and the chore for that day. We don’t have to put stickers or check marks on the list. We simply do the chores and don’t experience any of the guilt of falling behind on a complicated chart or reward system. Consistency – I have to remind my kids about their chores. I do hope one day some of the chores become a habit (such as: brush your teeth! ), but until then I have to work to keep them consistent with their chores. But I’ve also discovered that part of consistently doing chores means have a certain time of day set aside for doing those chores. We often do our chores in the afternoon while Punkin and Ladybug are napping (because they are not helpful during chore time). This allows me to help the kids if they need me and they are able to work quickly without added distractions. Having a consistent chore time and consistent reminders ensures that chores get done at our house. Positive Reinforcement – Chores are not fun. Let’s admit it. We don’t enjoy doing them either. So, we look for ways to encourage our kids with their chores. We don’t pay our kids for the chores they do. We consider it just a part of living in our house and being part of our family. Chores are simply a part of everyone’s job as we work together. Instead, I try to compliment something specific about the job that they did each day. And sometimes we surprise them with new books, puzzles, or toys, or even fun nights out for doing a great job with their chores and keeping a positive attitude. We make sure to tell them that we appreciate their willingness to help around the house. Check ups – After the chore training at the beginning of a new chore responsibility, it’s easy to just walk away and let them do their jobs. You might find that the job is done well for a while and then they seem to slack off. I’ve resolved to be involved in the overseeing of all the chores even if it takes so much of my time. 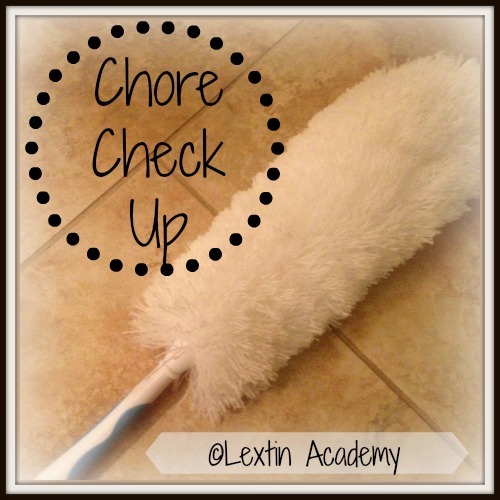 I check in on my kids as they do their chores and every few weeks I step in and do some of their chores with them to make sure they are doing a good job and remembering what I’ve taught them about each chore. Chores are a joint effort at our house. There is light at the end of the tunnel. After years of training, my boys now do most of the house work and it saves me hours a day!